Batter Up! Get in the game at the Disney All Star Sports Resort. 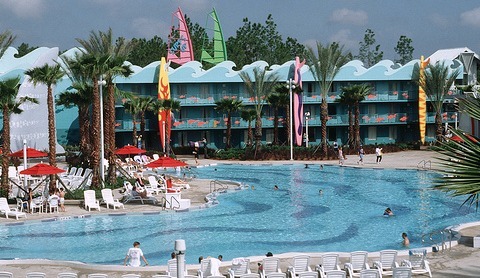 The resort hosting 1920 Disney value resort rooms opened in 1994. Ten buildings house the All Star Sports standard-sized value rooms themed after baseball, football, tennis and surfing. The resort has two pools, an arcade and food court. The All Star Sports hotel is near Blizzard Beach in the Animal Kingdom resort area. The Disney All Star Sports Resort property displays huge colorful icons reflecting the theme of each respective hotel. The themes are eye-catched and appealing, especially to children. The Surfs Up buildings sport large surf boards and lifeguard stands. The tennis buildings have larger-than-life tennis ball cans and tennis racquets. Enormous baseballs, hats, stadium lights, scoreboard and a gigantic coke cup adorn the baseball area. 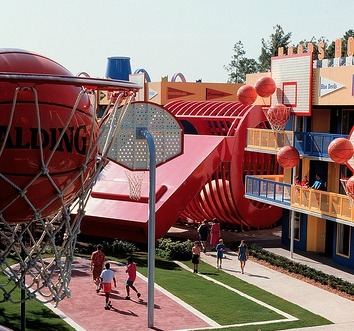 Hoops Hotel has an eye-catching basketball theme with multiple balls and hoops in play. The king rooms are handicapped accessible and are available upon request. They have a larger bathroom with a shower only, no tub. On the downside, the larger bathroom means less space in the hotel room. Call housekeeping for an iron, ironing board, hairdryer, towels, blankets or other items needed. As a Disney value resort, the buildings have exterior corridors and are three stories high. Standard or preferred rooms are available. Preferred rooms are closer to the hotel amenities. Room views include parking lot, pool and courtyard. Stadium Hall is the main All Star Sports building and contains the amenities including check-in and concierge. The concierge is there to assist you with your needs, such as advance dining reservations. Also in Stadium Hall are the Sport Goofy Gift and Sundries gift shop, Game Point Arcade and End Zone food court. The food court serves American food from five service stations. Pizza delivery is available to the All Star Sport resort hotel rooms. McDonald's is a five minute walk away. Update: The End Zone Food Court at the Disney All Star Sports Resort will be closed for refurbishment August 3 - December 20, 2013. Only Grab n Go foods (premade) will be available during that time at the arcade. The arcade will not be operating as an arcade during this time. Food Courts and arcades are available at the All Star Movie and All Star Music resorts. Bus service will be running between the resorts. The All Star Sports resort bus stop is located at Stadium Hall. The buses are sometimes shared with other All Star Resorts which can result in standing room only. 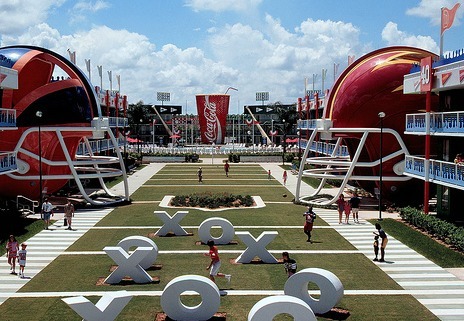 The All Star Sports Hotel football buildings surround a huge football field with large X's and O's. The tennis area also has an open courtyard area. The resort has a playground. A 1.5 mile jogging trail goes through the All Star Resort area complex. It is a five minute walk to the All Star Music Resort. The Disney All Star Sports Resort features two pools. The larger Surfboard Bay pool has 242,471 gallons of water and a kiddie pool. This pool is located in the Surfs Up area behind the main building, Stadium Hall. The Team Spirits pool bar is at the Surfboard Bay pool. The Grand Slam pool is in the Home Run Hotel area. The baseball diamond-shaped pool is smaller and quieter than the other pool. A large statue of Goofy stands atop the pitcher's mound. Showers, locker rooms and changing rooms are available at the pools. Disney does not provide towels at the pools. You must bring the towels from your room. The towels are not large beachtowels, but are adequate.